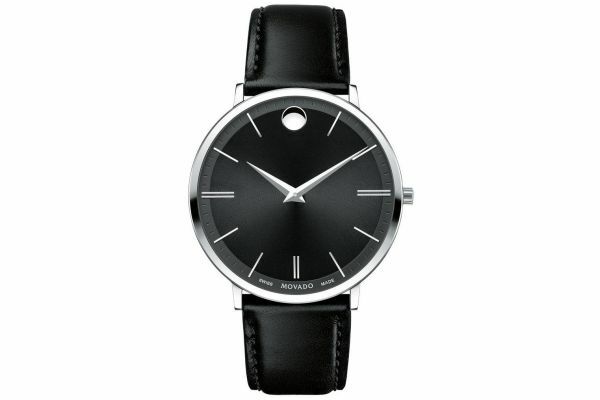 This stunning Movado men's dress watch is a piece from the Ultra Slim collection and sits perfectly flat on the wrist, great for under a shirt for work or a special occasion. The simple glossy black dial is complimented beautifully by an all black genuine leather strap and steel buckle. The steel casing is continued onto the dial with large striking batons and the sunspot at 12 o'clock. This watch houses a Swiss Made quartz movement and comes with a 2 year guarantee. For us to size your new Movado Ultra Slim watch as accurately as possible, please take a look at our downloadable Watch Sizing Guide.